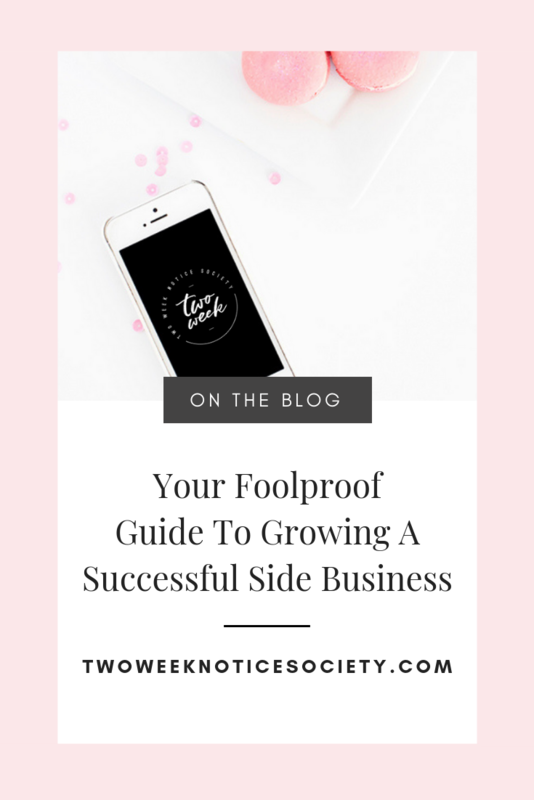 In this post, I am sharing my foolproof guide to growing a successful side business. After growing multiple successful businesses for over 2 years now, I’ve learned a thing or two about how to grow a business while also staying on track and not getting too overwhelmed. Don’t get me wrong, growing a business is hard. Really hard. And as your business grows, it gets even harder. It gets especially difficult to consistently stay organized as your task list grows longer and longer. And the overwhelm, don’t even get me started! Growing a business is a constant balance of prioritizing your list of to-dos, not allowing yourself to get overwhelmed, and increasing your revenue...all while serving your audience, community and clients. Below is the foolproof strategy that I follow every single day to stay organized, beat overwhelm, and grow my businesses. My rule in business has always been to learn everything you can from those who have what you want. So let’s dive in! When I FIRST started my side business, I did NOT think that working on my mindset was important at all. I thought it was a waste of time and I needed to be spending my freetime working on things in my business. I thought that if I worked hard and long enough that the money would eventually start rolling in. I couldn’t have been more wrong! I TRULY believe that the secret ingredient to success is to work on your mindset EVERY SINGLE DAY! The thing is, I didn’t feel like I was good enough to be super successful like all the entrepreneurs I envied, yet I wanted it so badly. I had a limiting mindset and it was hurting my success. I joined an incredible group coaching program where I saw amazing women crushing their goals, making 6 figures and it made me believe, if they can do it, why can’t I then? It suddenly seemed easier than what I had thought. While I was in my 9 to 5 and READY to leave and go out on my own, I used to dread mornings. And not just Monday mornings, EVERY morning. Everything changed once I started re-evaluating my mindset and goals. I read 2 books that significantly changed the way I looked at mornings and how they fit into creating a life I wanted to live. Those books are The 5 Second Rule by Mel Robbins and The Miracle Morning by Hal Elrod. The 5 Second Rule helped me create the mindset I needed to adopt to start getting things done. The Miracle Morning covered the technical aspects and helped me to create a routine. I highly suggest reading them if you’re looking to make a big change in your life. My mornings to myself are now something I truly look forward to everyday. Some days are harder than others, but now I’m at a place where I can’t believe how much more I’m able to accomplish. I have gone from scrambling out of bed (in a bad mood) at 6:45 am, to popping out of bed to get started on my day at 5:00 am! This is an extra 10 hours during the weekdays! Crazy right? While I was still in my 9 to 5, this allowed me to work on my side hustle in the morning before I even went to work and gave me more time and freedom after work. Want to know the one thing that every 6 and 7 figure entrepreneur does every day? Check out this blog post! While I was still in my 9 to 5 and building my business, I felt overwhelmed and distracted all of the time. It’s because there’s a million and two things swimming around in my head. Personal to dos, business tasks, appointments I need to make, things I’m worried about, bills I need to pay…the list goes on and on! Can you relate? When you’re stressed and overwhelmed, there’s a tornado of thoughts that are whirling around in your head that’s difficult to stop if you keep it all in there. If you take the time to write down all of your thoughts, to-dos, and worries, you’ll start to feel less overwhelmed and can create a plan of action for each thought. This is often called a brain dump and it is immensely helpful. Try spending 10-15 minutes every morning writing down everything on paper that in your head. Then you can move on to the next step! Each morning ask yourself, what’s the one most important thing to do today? Which one task do you need to get done in order to call your day a success? If I don’t prioritize, I get super distracted and hop around from task to task while sometimes overlooking the most important jobs. Now, I force myself to choose just one (ok, full transparency - one to three) top item from my list each morning and put a star next to it. My most important task might be publishing a new blog post, writing email to my list, creating content for my Thrive Without The 9 to 5 course, or even something relatively minor like responding to an email I’ve been putting off. If I can check that one item off my list, I know I’ve achieved what I need to. After checking off my main goal, I usually feel a big sense of relief and achievement, which powers me through the next few items on my list. Of course, I usually do much more than one task each day. But at least this method means I keep my business moving forward – even on days when I feel overwhelmed and really can only handle one thing. The point is not to only do one thing each day. The point is to identify the tasks that will make the most difference to your business, and avoid procrastinating on minor jobs. You might also want to look into the 80/20 rule, and identify the 20% of tasks that actually have the biggest impact on your income. Learn how to make Sunday your most productive day in this blog post! Energy management is somewhat of a new concept people have begun to discuss more and more. The concept is simple: you should be managing your energy and not your time. The number of hours in a day is fixed, we all only have 24 hours in a day. But if we maximize our energy, we can bring our best performance to whatever task we’re working on and can achieve maximum results. The best way to keep growing a business if you ask me! Here’s the thing to remember: we have to be realistic with what our own lives look like and not compare to other people. We all have different priorities. Some of us have children, some of us do not. Some of us have pets, others don’t. Most of you reading this have 9-5 jobs, others may be doing your business full-time. You need to be realistic about how much time you have and you need to really know yourself for this to work. When are you most energized throughout the day? When do you have pockets of time available to you? What obligations do you have that you need to attend to? Take a look at your tasks from your brain dump list and note how much energy they take. For example, answering emails may take less energy than writing a new blog post. So you should write your blog post when you have the most energy. For most people, this is in the morning. Or maybe it’s vice versa! That’s why you need to know what drains your energy and when you’re most focused. We know not everyone is at a point in their business where they can hire someone but there are probably things in your personal life you can delegate too! You’re a girl boss growing a business and you need to take some tasks off your plate. Here are some examples of things you can delegate at home or in business. The point isn’t to try and start delegating and outsourcing everything at once. Pick and choose one or two things to get started. Be creative! Maybe a kid in the neighborhood is looking for extra work and can mow your lawn and walk your pets for cheap. Or maybe you do a meal prep once a month with a friend and you exchange meals. The opportunities are endless. All you need to do is ask for help! Full disclosure: This one is still a work in progress for me. Just want to be real with you all! There’s been so much research on how multitasking doesn’t work, yet almost all of us do it. Why is that? Our brains are not able to focus on multiple tasks at once and our productivity is reduced significantly when we try to multitask. The secret to growing a business in a consistent way is focusing on one task at a time, completing it, and moving on to the next task. The pomodoro technique is the most incredible productivity hack. If you only take one thing away from this post, I want it to be this! The pomodoro method involves working uninterrupted for 25 minutes. And I do mean uninterrupted. No checking your phone, no wandering off to get a drink or use the toilet. It’s only 25 minutes, right? You can do it! Just 25 minutes, with a timer, of nothing but focus on the task in hand. When your timer goes off after 25 minutes, set another timer for 5 minutes and allow yourself a short break. If you have the time, the aim is to do four sessions of 25+5 minutes, followed by a longer 30 minute break. It’s good practice to jot down how many sessions you’ve taken and what you’ve achieved in each one. The method is named after the Italian word for tomato, because the creator used an old-fashioned tomato-shaped kitchen timer to measure his sessions. You can use an online pomodoro timer here, or just use your phone. I have the app on my laptop and it’s incredibly helpful! It might sound simple, but it’s amazing how effective this is. I think a lot of us who work full-time while trying to grow a business (or even those of us that work full-time in our business!) struggle with distractions like email, social media and research. But 25 minutes can really be a long time when you commit to ignoring the distractions. For people who struggle to focus (me! ), this technique feels like conjuring up extra time out of thin air. It might sound ridiculous, but I feel like there are literally more hours in the day when I work in pomodoros. The pomodoro technique pairs really well with the prioritization technique above. Pick ONE thing to do today, give yourself 25 minutes, and get it done! You’ll be amazed at how much more you get done with this laser focus. What productivity tips do you use? Believing in myself enough that I COULD actually do it. Getting rid of old beliefs about our working society. That corporate jobs were the only way. Making the time to do the work on the things that really mattered in my business. Taking the time to find people to build relationships with on Instagram and Facebook. Surrounding myself with other women who inspire me and are doing what I want to do. Showing up consistently and showing my face on social media. I know this sounds cliche, but if I can do this, YOU can too! Once you start opening up your mind to all the possibilities that are out there for you, and you put all your energy into your passion, that’s where the magic happens.